Solving society’s problems through sustainable materials, healthy living and translational success. Building knowledge and developing techniques for slowing down stem cell depletion and loss of function in the human body. Development of leading program in next generation point of care diagnostics. Positioning as key leader for future adaptive and smart materials in the area of functional polymers and adaptive polymer materials. Based on strong collaborations in the area of nanoparticles for animal vaccines and crop treatment. Use of synthetic and systems biology to design superior products and processes​. The University of Queensland's Australian Institute for Bioengineering and Nanotechnology (AIBN) is an integrated multi-disciplinary research institute bringing together the skills of world-class researchers in the areas of bioengineering and nanotechnology. AIBN seeks to deliver innovative solutions to society's problems through sustainable materials, healthy living and translational success. Our research is underpinned by AIBN's Five Pillars of Research, which cover stem cell ageing and regenerative engineering, precision nanomedicine, advanced materials, agriculture nanotechnology and advanced biomanufacturing. These pillars focus AIBN’s research efforts on developing new products, processes and devices for improving human health, the environment and quality of life. In this way, the Institute goes beyond basic research to promote and develop the growth of innovative industries, which will benefit Queensland and Australian economies. We live in exciting times as our ability to look down to and manipulate at the atomic scale allows for tantalising prospects. New scientific discoveries are made every day, and AIBN has proven to be one of the world leaders in turning these discoveries into applications for better health and sustainable solutions for energy, manufacturing and more. Many technologies developed under AIBN’s roof play a significant role in shaping our society and environment for the better. In 2015 with the stepping down of Inaugural Director Professor Peter Gray, AIBN saw the end of an era that started with its foundation in 2002. I now have the honour to further develop this Institute with its proven reputation for research excellence, its world class facilities, and its talented cohort of staff and students. 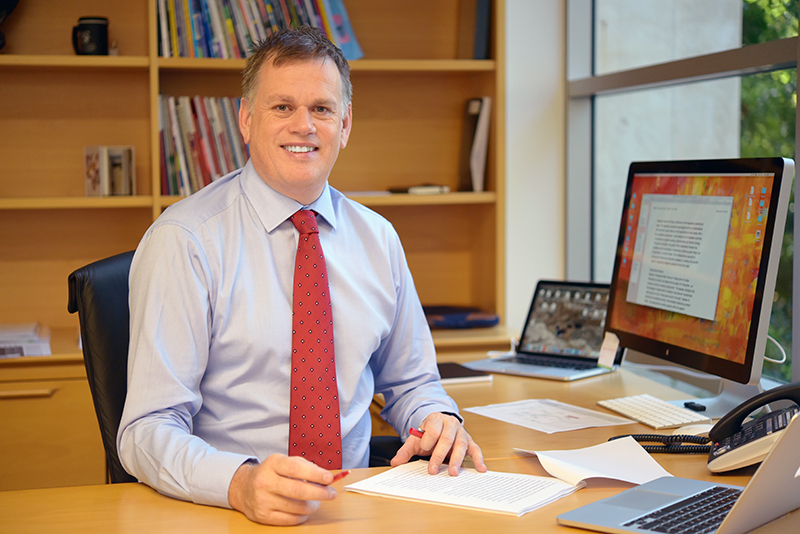 The Institute owes tremendous gratitude to Professor Peter Gray for his courage and dedication to join UQ and establish this incredible lasting legacy. I am excited to step into this role with the foundations well and truly established; the people in place, the research programs developed and infrastructure built. There are a great – and ever increasing – number of people who owe their careers and livelihoods to AIBN, and I hope Professor Gray takes great satisfaction in what he has achieved. Coming to AIBN with my external perspective from the Radboud University Nijmegen, Netherlands, in my opinion the Institute’s greatest strengths are its dedication to applied research outcomes and the breadth and scope of the work undertaken. They are a truly unique and remarkable combination. I look forward to cultivating those strengths and building upon them. I would like to particularly recognise the work of the AIBN Board, which has been ably chaired by Euan Murdoch, and fellow Board members Kathy Hirschfeld, Chris Lowe, Bob McCarthy, Susan Pond and Robyn Ward. Additionally, I would like to acknowledge the efforts and direction provided by the Scientific Advisory Board. The support of the greater University of Queensland also deserves our thanks. Since my arrival to this university I have been pleased to see the collaborative nature UQ shares across its institutes, schools, centres and faculties, which I intend to further explore. The leadership of Professor Peter Høj (Vice-Chancellor and President), together with Professor Joanne Wright (Provost (Acting)), Professor Robyn Ward (Vice-Chancellor (Research)) and Professor Anton Middelburg (Pro-Vice-Chancellor (Research and International)) has been pivotal in the success of the university in recent years, and fostering an environment in which AIBN has been able to thrive. I look forward to a future in which AIBN will continue to turn ground breaking science into innovative applications, from advanced materials and diagnostic tools, to cures for important diseases and many more. Close cooperation with medical professionals and industries will be key to achieving such goals, as is providing promising young academics with the entrepreneurial skills required to turn cutting edge science into successful products. The foundations for a dynamic AIBN, recognised around the world, have been laid. Now it is my challenge to enable it.